This summer, the Rootstein Hopkins Parade Ground at Chelsea College of Arts has played host to a major sculpture. Crossing (Horizontal) by Nigel Hall has been on display since March, and this week is the last chance to see the work before it is returned to Yorkshire Sculpture Park on 20 May 2015. Nigel Hall is an internationally renowned artist and was previously Head of Sculpture here at Chelsea in the 1970’s. He He studied at the West of England College of Art, Bristol and then at the Royal College of Art and was elected a Royal Academician in 2003. The siting of this monumental work is part of the 10 year anniversary celebrations of Chelsea at Millbank. To coincide with its installation, Chelsea’s Triangle Space gallery held and exhibition Nigel Hall’s large scale drawings in March. 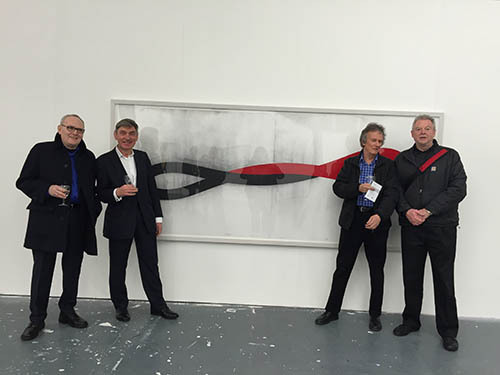 Artist Nigel Hall with Nigel Carrington, Vice-Chancellor UAL, Chris Wainwright, Pro Vice-Chancellor and Head of Camberwell, Chelsea and Wimbledon and Peter Murray, Director of Yorkshire Sculpture Park at the opening of the exhibition at Chelsea’ Triangle Space.